Spring has really kept us waiting this year. In anticipation of warm, sunny days, RBTH encourages to delve into the world of springtime music. “The Snow Maiden” is a philosophical musical composition by Nokolay Rimsky-Korsakov, dedicated to the immense wonder of nature. The story of the opera unfolds during spring, as nature begins once again to give us the gift of its beauty. This beauty is embodied in the character of “Snegurochka,” the Snow Maiden, who is the daughter of Frost and Spring. However, as she is born of Frost, she cannot understand the concept of love. Spring, the Snow Maiden’s mother, sees her daughter’s suffering and, following her tearful requests, eventually agrees to give Snegurochka the feeling of love, as painful as it is. As Snegurochka’s heart begins to understand the feeling of love, her ice-cold beauty begins to melt away. The opera concludes with a solemn and sublime ode to the sun and Jarilo (the god of springtime), during which the fragile tenderness of the Snow Maiden disappears. All of the prosaic scenes of the opera, including Maslenitsa (“pancake week”) celebrations, joyous circle dances and shepherd’s songs, are laced with lyrical motifs of nature blossoming in springtime. Peter Petrovichev “Cherries in blossom” (1919). The Vladimir-Suzdal museum-reserve. “Spring Waltz” by Dmitry Shostakovich will help listeners become further immersed in the world of a blossoming springtime garden. This composition was written for the film “Michurin” and based on the life of Ivan Michurin – a Russian expert on selection and a renowned biologist, who dedicated his entire life to plants. Thanks to his work, numerous types of fruit trees were derived. He loved nothing more in life than watching new life grow from a single seed. “Spring Waltz” plunges us into the atmosphere of Ivan Michurin’s flourishing spring garden: Hundreds of new trees bathe in the long-awaited sunshine, as they awake from their slumber and give birth to new life that will later put its own seed into the earth to be born once again. “The Seasons” by Pyotr Tchaikovsky consists of 12 compositions, each dedicated to a specific month. Each piece captures the composer’s feelings, emotions, experiences, as well as scenes of life associated with each season. The composition dedicated to March, “Song of the Lark,” creates the mood of early spring. As patches of earth begin to appear amidst the not-quite-melted snow, and the first rays of sunshine begin to brighten the sleeping nature, winter is in no hurry to relinquish its power – only the lark’s song announces to the world that spring has arrived. These flowers provide us with the initial beauty of spring, although we are still surrounded by snow. The snowdrops echo the music of the lark, as a visual reminder that spring is upon us. The musical composition “White Nights,” dedicated to May, takes us into the white nights of St. Petersburg. Tchaikovsky was particularly fond of St. Petersburg, as the northern city is where he spent his youth and became a composer. In his depiction of nature, the composer is able to combine the phenomenon of night with light, thus representing the complex fusion of human emotions in this piece of music. From the very first bars, the audience captures the romance of white nights. This composition by Sergei Rachmaninoff tells us about dramatic events that unfold in early spring – love, betrayal and premeditated murder. In this piece, nature does not act merely as a backdrop, but as an active participant in all of the events. In the same way, the harsh character of Winter convinces the protagonist, who has caught his wife with her lover, to kill her. However, as Spring arrives, promoting love, peace and patience, she is able to soften the hero’s anger. In this piece, you will not hear the gentle, warm tones of nature gradually awakening in springtime; Rachmaninoff’s cantata depicts Spring as being strong and saturated. “The ‘green rustle’ hums along. The green rustle, the rustle of spring!” This is the main part of Rachmaninoff’s ode to spring. In Alexander Glazunov’s fairy-tale ballet “The Seasons,” spring is depicted as light and colorful. We are surrounded by birds, flowers and a warm zephyr breeze. After the first scene, “A Winter Landscape,” two grey-haired gnomes run out of the forest and strike a fire from stone, which drives away winter and its faithful servants – snow, ice, frost and hail. Everything around becomes covered in flowers and birds begin to appear, marking the beginning of spring. The main theme of the ballet is the eternal revival of nature and life. 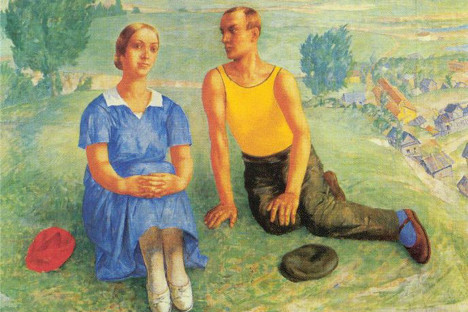 “The Rite of Spring” by Igor Stravinsky takes us into the world of pagan Russia. In order to wake the earth from its winter sleep, ancient Russians would sacrifice a young girl to spring, and the girl would have to dance until her death. Springtime circle dances, ceremonies to worship the earth, ritual folkdances and the death dance of the young girl are accompanied by the music of springtime nature in bloom. The composer presents his view of nature with the help of intense, spontaneous rhythms, powerful energy and tremendous delivery and expression. The complex counterpoint and the abundance of irregular rhythms represent the depth of feeling of early Russians toward the rhythms and sounds of spring and its immense energy. This ballet is considered to be one of the most complex compositions in musical history.